The sun takes time to heat up the earth. I've mentioned similar things in my previous post re: the sun, but it is worthwhile clarifying this issue further, particularly as I believe that this basic phenomenon is not sufficiently well understood. It is common knowledge that it takes time for the sun to heat up the earth on an average day. The rays hit the ground, then infra-red radiation is released from the earth. Thus, while the sun is most intense at the zenith, the average day is MUCH hotter AFTER NOON than pre-noon. Not only does the earth (and water) heat up slowly on a given day, there is residual heat stored in the surface of the earth (in earth and water). This means that even though the shortest day (in the northern hemisphere) occurs on December 21 and the longest on June 20/21, the seasonal response is not a precise reflection of the total quantum of the sun's rays that fall on earth. The autumn takes longer to 'die out' into winter and the spring takes longer to 'kick in' after winter. 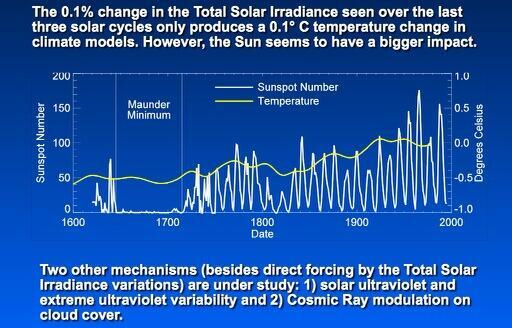 EXACTLY the same principle applies to the effects of the impact of changes in the sun's intensity over time. There is a HUGE multi-decadal effect at work. When the sun warms up, heat enters the deepest waters of the sea. Over time, some of this is radiated back, but this takes time. This lag can be seen clearly from data on sun-spots below. The sun started revving up after a very stagnant performance between 1600 and 1725 AD. The little ice age kicked in after a lag of around 50 years. Once the sun started warming up (and became MUCH more active in the earlier part of the 20th century), it took time to warm up the earth with a much longer lag – between 50-100 years. Studies that look at precise annual correlations between sunspot activity and global temperatures will fail. There is only a weak correlation between these two at the annual level. Instead, we need NONLINEAR MOVING AVERAGE of some sort that controls for baseline conditions of temperature on earth. For instance, the initial heating up will take longer to impact, and the later increase in intensity should impact quicker. Only such a study – that mimics the ACTUAL process of heating of the earth, will produce worthwhile results. I suspect, from the data that I've seen, that such a study will almost entirely wipe out the share attributed to CO2 in climate change. (CO2 affects are logarithmic, and steeply peter out after a much lower concentration level than what is found in the atmosphere today). In addition, of course, as I've already pointed out, there are many other factors that drive climate. So no single variable is going to fully explain changes in climate. But nothing alarming is going on at the moment. Alarmists, though, tend to get all the press. That's just the nature of the human mind. Let us spend the next 100 years understanding it better, instead of running about like headless chooks, claiming that the sky is falling down. « History is pointless if it doesn’t help us. Let’s use it to solve problems, not to create problems. Apparently a new report this month has shown that the sun's effect on long term climate change has been overestimated and human impacts have been underestimated. Also, neither your analysis nor your graph explains the title of your post – namely the issue relating to primacy. It's a sensationalist headline. According to scientists the influence of greenhouse gases emitted by humans dwarfs the impact of the changes in the sun by a factor of 10. This assertion was made by <a href="http://www3.imperial.ac.uk/people/j.haigh">Joanna Haigh</a> whose research was published in Nature this month and who's the head of the atmospherics physics department in Imperial College in London. When it comes to scientific fact and theory, I assert once more that it's best left to scientists whose job it is to analyse, interpret, and collect the data. If they're later proved wrong within the scientific community, even better. I'll change my views again depending on what the vast bulk of scientists say. When I talk about the number of sunspots representing the level of solar activity, I am making using an assumption based on the fact that a little Ice Age came in a relatively short while (50 years or so) after the sun spots virtually disappeared. If reduced sun-spots INCREASE solar heat, as is being speculated in this article, then, of course, the entire history of the climate will need to be reviewed. That fact, if true, would still not automatically imply a significant role for CO2. (for some reason all the graphs on that page have disappeared. I think I know what is happening. Let me check what can be done). Re: When it comes to scientific fact and theory, I assert once more that it's best left to scientists whose job it is to analyse, interpret, and collect the data. If they're later proved wrong within the scientific community, even better. I'll change my views again depending on what the vast bulk of scientists say. I won't go into this once again with you. On complex matters I know of NO ONE I can trust as a reliable source of knowledge. I have found this from hard experience and learning and therefore prefer to do my own intensive reading and thinking. What I understand and what makes sense, I accept, the rest I discard. On climate change I believe there exists NO ONE today who understands the whole picture, and the science behind it is totally primitive, nor is there sufficient data on crucial aspects. Scientists who can't explain ALL the facts of a case fail to explain. Just like the entire parts of a murder story must fit, those who pick one aspect of climate fail to explain other aspects or take into accounts those aspects. Hence I read/understand them but make up my own mind. In most cases I have found my own judgements (after considered reading and understanding, and experience) to be more reliable than those of "experts". I am a one man self-deciding "expert" if you will call me that. Essentially I decide for myself. I NEVER rely on others on complex matters. On trivial skills like flying a plane or cutting open my heart during heart surgery I don't mind "experts" doing their well-trained job. But I don't rely on anyone’s explanation of complex matters. Let's not repeat the whole thing again. You choose to believe. I choose to understand. Big difference.